I won’t lie. I drink an awful lot of sake. I don’t mean in an “intervention required” type way but in that I get to drink many different types of sake. But despite drinking sake of all kinds of rice variety, brewing method, yeast propagation and style there’s something to be said for that sake that comes along once in a while and just puts you on your arse and reminds you what simply great sake tastes like. It’s like a re-calibration of your palate that reminds you to not get blasé about sake and to keep your eyes out for those sake unicorns. My most recent encounter with such a sake was from that wonderful sake region that’s always in the news for all the wrong reasons, Fukushima. Yes, in case you weren’t sure Fukushima sake is open for business. Not that many of them were out for long. Fukushima is still consistently producing some of the finest sake in the country despite environmental hazards which I won’t comment any further on as there are far more qualified people out there to discuss the topic than I. So what was this amazing sake that made me sit back and take stock of my sake-soaked life? Well, in continuing on from the current trend of Hiyaoroshi (Autumn seasonal sake) this particular Junmai Ginjo is also a seasonal release, this time from Miyaizumi Shuzo. Miyaizumi actually label all their sake that is sold in other areas of Japan outside of Fukushima as Sharaku (interestingly though the sake that makes to it to the overseas market is usually labelled Miyaizumi). The Sharaku Junmai Ginjo Nagoshizake (Nagoshizake meaning rested over summer) is traditionally released as the first of their autumn range in the Hiyaoroshi season. In Japanese the expression “nomiyasui” (easy to drink) is somewhat overused but in the case of Sharaku Junmai Ginjo it’s spot on. Aromas of bubblegum and boiled lollies backed with a hit of steely alcohol lead to a beautifully soft palate. Clean, sleek and ever so slightly sweet, the way this sake seems to melt in your mouth just keeps drawing you back for more. And for me, that’s usually the sign of a great sake; one that keeps dragging you back for that one more sip. Coincidentally, I met one of the sales managers of Miyaizumi Shuzo at a tasting recently and he inferred that there are still many people wary of sake from Fukushima. However, he explained that due to the situation in Fukushima they are conducting more thorough tests more regularly than any other part of Japan with absolutely no signs of radioactive contamination in any sake to date. 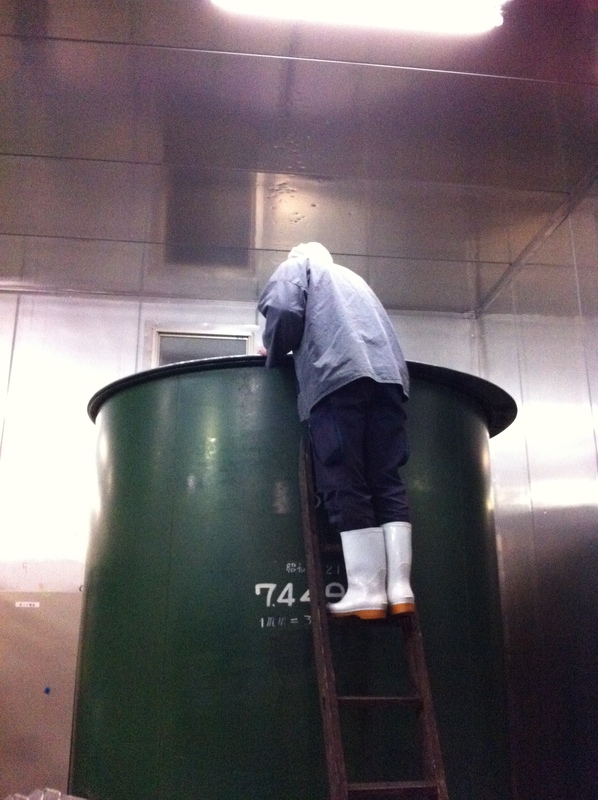 Which by way of the amount and detail of testing actually makes Fukushima sake possibly the safest in Japan. If you’ve been anywhere near social media recently and more specifically hanging around sake interested types you would have heard the great news that “The Birth of Sake”, a Kickstarter funded film has achieved it’s donation-funded budget and will be completed for release next year. Why is this great news? Well, it’s the first of its kind for starters. While there are plenty of films and documentaries floating about the place singing the praises of chefs, restaurants and wine, there has never been a mainstream Western-produced documentary on the making of sake and the people behind it. Created by film-maker Erik Shirai, this film takes a look at a Yoshida Shuzo makers of Tedorigawa in Ishikawa prefecture and features not only the fundamental physicality of making sake but also looks at the relationships of the brewery folk and how spending six months of the year together brewing sake shapes the people who make the sake. If the buzz that accompanied the recent Jiro Loves Sushi documentary is anything to go by I think this could be a real door-opener for the uninitiated into the world of sake. As the brewing industry looks more and more to overseas exports, the attention a film like this could bring the whole industry is surely a boon for all. So on that note I figured I best get out and try me some Tedorigawa sake to see what all the fuss is about. To be honest I have tried Tedorigawa before a couple of years ago but a little revisit never hurts. Fortunately it wasn’t too hard to pick up a bottle of Tedorigawa Junmai. One sip of this fairly unassuming Junmai though and it’s hard to not get excited about more people knowing about Tedorigawa and their sake. Carrying a fairly high seimaibuai (rice milling rate) of 50% (for the koji rice) and 55% (for the rice added to the mash) I was expecting a lighter perhaps more fragrant style of Junmai but was pleasantly surprised that the full bodied umami wasn’t lost to the high level of milling (Generally, the higher the milling rate the lighter the body and lower the umami). The aromas are definitely of a more stone-fruit driven fragrant, almost Ginjo-esque variety than some of the stoic, muscular Junmai but the way the sake holds its weight alongside the aromas is quite extraordinary. Waay to easy to drink and definitely moreish. Probably better suited to richer types of food but drinks plenty good on its own too. 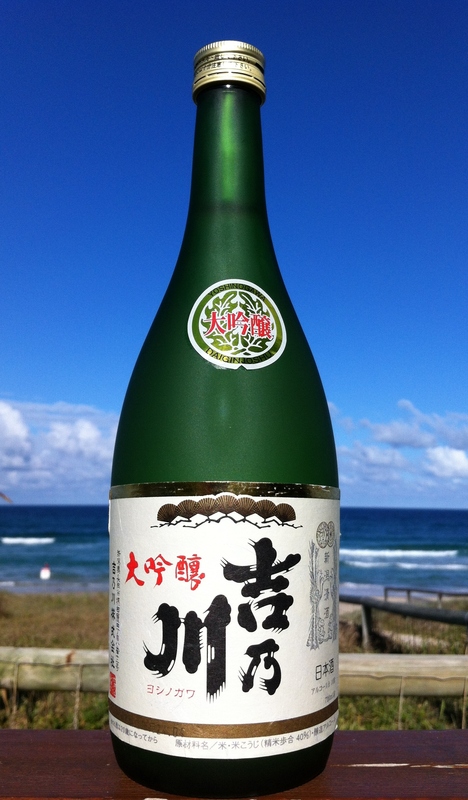 And to top it all off, incredibly reasonably priced for a sake of its calibre at just over Y1000 (around $12AUS). Sadly, we have to wait until the latter half of next year to see the movie but make some calls, pull some strings, call in favours and get yourself some Tedorigawa sake to tie you over in the meantime. Change In Direction AKA Farewell! While it may seem as though I’ve been neglecting my Sake Australia duties, I do have a reasonable explanation. The last month or so has seen me packing up and preparing to return for another stint in Japan. After six years of Australian life since coming back from Japan I’ve decided to have another crack at Japanese life. I aim to continue Sake Australia but will obviously take a more general approach to covering sake rather than just what’s available in Australia. It’s been fantastic to see the growth of sakes’ profile in Australia in the last six years. When I first came back from Japan most liquor stores sold only one variety of Japanese made sake and to have sake on a beverage list of a non-Japanese restaurant was unheard of. Now it’s a different story with several bottle shops expanding to having a “range” of sake and restaurants of all kinds adding sake to their menu. Knowledge has also jumped to new levels with punters and sommeliers alike spouting sake terms such as “junmai”, “ginjo” and “seimaibuai” as if they were second nature. There’s still a long way to go till sake receives the attention of beer, wine or even whisky and to be honest it may never come but it’s good to see so many restaurants, suppliers and retailers fighting the good fight and pushing to get sake the spotlight it deserves. I look forward already to my next trip back here to see again how sake has grown. In the meantime I’ll do the best I can to not neglect this blog as much and do my own bit to bring you more of the goings on in the sake world in Japan from this Australian’s perspective. Despite Australia seeing barely a fraction of the range of sake available in Japan it’s funny how some people are so quick to already look for something new, different or off the wall. When talking to folks interested in sake I’m coming across more and more people who want to know about barrel-aged sake, long-term aged sake, sake made with ridiculously low seimaibuai, wild yeast strains and also unusual rice varieties. Which brings us to Ine Mankai’s Red Rice Sake. Relatively speaking, this sake seems to garner quite a bit of attention. So what’s it all about? You may remember we actually looked at Hitachino Nest’s Red Rice Ale, a beer made with an addition of a particular rice with a red/purplish hue. Well, this is pretty much a sake version. Although red rice sake is certainly rare it is not new. Red Sake or Akazake (or sometimes Akaisake) has traditionally been made in a number of ways. 1. Probably the most famous style is that which originated in Kumamoto prefecture where the sake was made in the usual way with ash added to the sake mash traditionally to prevent spoiling but also adding a reddish tint to the sake. 2. Another type, popular in Niigata is made using a type of koji that has a natural red pigment. 3. Finally, there is the method of using actual red rice, usually in conjunction with regular sake rice. Often differentiated by being referred to as red rice sake instead of red sake. Makes sense huh? Ine Mankai is made by Mukai Shuzo in Kyoto. With a rich history dating back to 1754, Mukai Shuzo also boasts the honour of having one of Japan’s first female toji Kuniko, daughter of the brewery owner who stepped up to take over brewing duties. One interesting thing about this sake for me is that it really cries out for food. Sure you could drink it on it’s own but the flavour profile lends itself to food matching. And this is where it’s popularity seems to stem from with restaurants picking up on it’s ability to be a sake that goes with dishes perhaps not normally associated with sake or Japanese cuisine. Yeah, yeah so what does it taste like? Different for sure. Firstly, with its rosy pink hue it looks gorgeous. Pomegranate and olives are the first aromas to jump out followed by hints of macerated cherry and whiff of marshmallow. Best served chilled; on the palate it hits sweet almost like port but without the heat and again with cherries and a bit of plum. My first instinct is to go with some pickles to munch on with this sake but I’d also go for sauce-heavy Chinese food of the sweet variety. An interesting sake for sure and well-crafted but definitely one for a certain occasion or meal. Sure it has “sake” traits but it feels like a sake for wine drinkers and as it turns out it’s mostly wine drinkers who have been talking about this sake here and in Japan. Some may consider it a “gateway sake” ie. punters who like this may be tempted to try other sake, however as this type of sake is something of a rarity it’s unlikely they’ll find much out there similar to Ine Mankai, as lovely as it is. 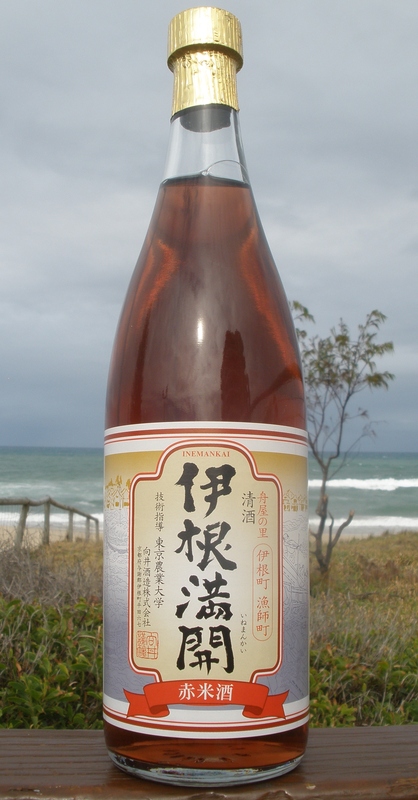 It’s also interesting to note that although the English label describes this sake as Junmai Genshu (pure rice sake, undiluted), the use of the red rice variety actually prevents it from qualifying for Special Designation status (Tokuteimeishoshu) so legally in Japan it cannot be (and is not) labelled as Junmai. All rice used in Tokuteimeishoshu must be inspected by the government and be of a specific grade to qualify. Any time I make a trip to Japan I always try to squeeze in a brewery visit or two and on my last visit I was fortunate enough to visit one of my favourites in Nishiyama Shuzo makers of Kotsuzumi from Hyogo prefecture. 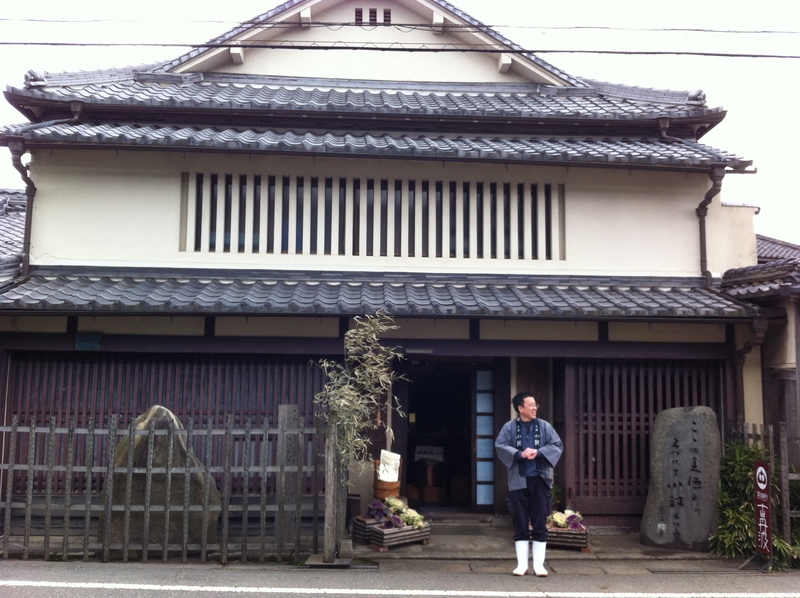 I first came across Kotsuzumi when I received a bottle of their flagship sake Tanko Junmai Ginjo as a souvenir from a friend but at the time knew little about them. It was an amazing sake that soon became one of my go-to sake whenever I visited Japan. So I was doubly excited when they warmly invited me take a look around the brewery. Established in 1849 Nishiyama Shuzo is in a beautiful, mountainous location in Tanba City in the middle of nowhere, Hyogo. Many breweries are located in difficult to get to countryside areas so as to have access to good water, and Nishiyama is no exception. Like many breweries their water is their pride and the folks at Kotsuzumi wasted no time in telling me their famous soft-water from the Takeda River which they pump from wells on site had been featured in the famous gourmet manga-comic Oishinbo where it was described as “plump, round with a surprisingly quick, fleeting finish. Truly a pure, bold water”. High praise indeed! The fact that the local water is soft-water is also noteworthy as most Hyogo sake comes from the Nada region famously for its particularly hard water. 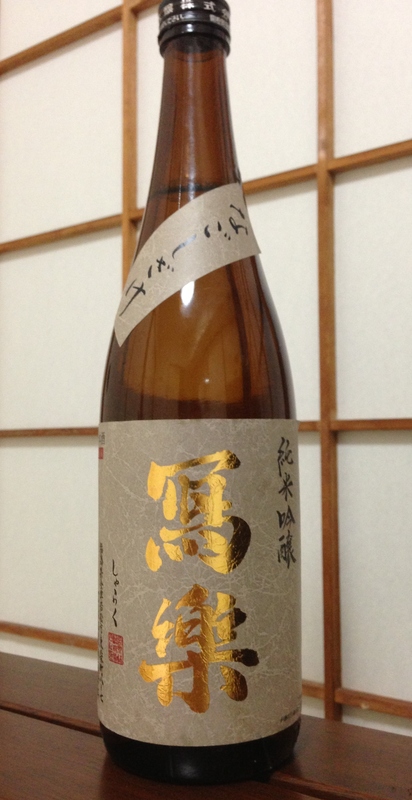 One of the first things you notice about a bottle of Kotsuzumi is the striking labels. All their Labels are designed by respected artist Hirosuke Watanuki. It was nice to see the motifs on the labels reflected throughout the brewery, all the signage and even the outside garbage bin bore a design from Watanuki-san which gives a unique feeling of continuity and consistency which also reflects in their approach to brewing. As Kotsuzumi’s Toji Yashima-san explained, they brew in small batches all year round to maintain consistency and freshness. Many breweries still follow the traditional style of doing all their brewing only in the cooler months and then spending the warmer months marketing and promoting (or even resting!). However at Kotsuzumi their year round brewing philosophy means if you spot a Kotsuzumi bottle on the shelves you can be sure it is only a few months old and unlikely to be from last year’s production. This “fresh is best” approach to brewing also means you won’t find any koshu or aged sake about. Again as Yashima-san explained, their small size and constant brewing system means they don’t have any tank or storage space even if they wanted to age their sake. But then again who needs it? 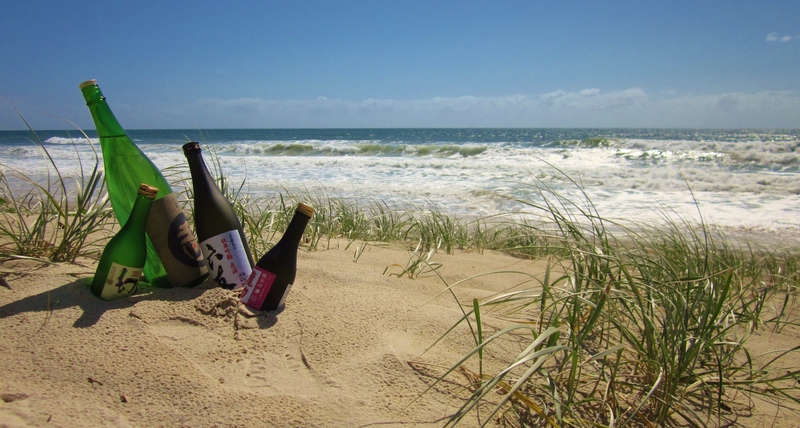 Nishiyama are very much a modern brewery and pride themselves on individuality. This is evident in their use of only locally grown rice including the familiar Yamadanishiki and Gohyakumangoku as well as the very local, organically grown Tajima-Goriki and Hyogo-kitanishiki. Also unusual is their almost exclusive use of Ogawa #10 yeast strain. 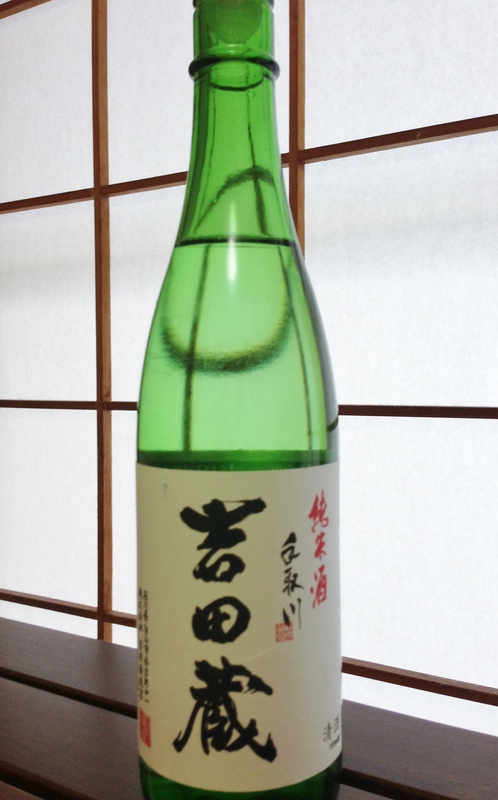 A far from common or easy to work with yeast strain that Yashima-san finds rewards with light, delicate, elegant sake. Breaking further from tradition is the method of having all brewery workers (kurabito) involved in all aspects of brewing without the Toji, Yashima-san keeping any secrets to himself. It is common or traditional in breweries for the Toji to take full control and responsibility for many aspects of brewing without delegating tasks of high importance to other brewers until they’re too old to do it all themselves. This is why you often hear stories of Toji who spend the brewing months living on only a couple of hours of sleep a day and working up to six months straight without a day off. Admirable but not always practical. After all if the Toji were to become sick, production would ground to a halt. By making the techniques, brewing data and know-how of the Toji available to all the brewers consistency is guaranteed. A smart move in these fiscal times I’d say. These days it’s hard for a brewery to make ends meet on just sake alone so mnay of them branch out with other products usually starting with Ume-shu, Yuzu infused liqueurs and often shochu. Nishiyama Shuzo is no exception producing all of these as well as grape liqueur, strawberry liqueur and even Amazake yoghurt. Amazake, if you’re not familiar is a sweet, non-alcoholic beverage made using koji and rice, often drunk warm. 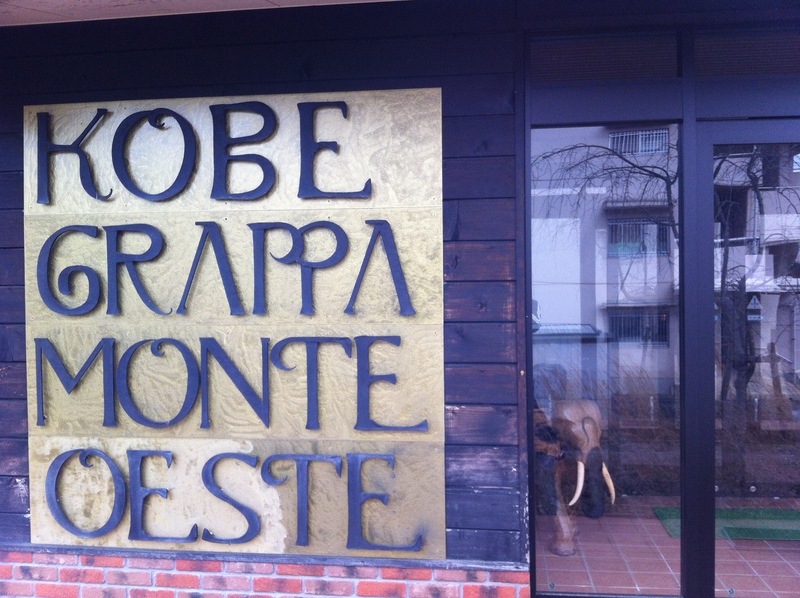 But beyond these I was most surprised to be shown their Grappa distillery(!). Yep, of all places to find Italian firewater, it’s being distilled out in the boondocks of Japan. Of course on such a trip I was unlikely to leave without a couple of bottles and I couldn’t resist grabbing a “fresh-as-can-be” bottle of the Tanko Junmai Ginjo and Tokubetsu Junmai. 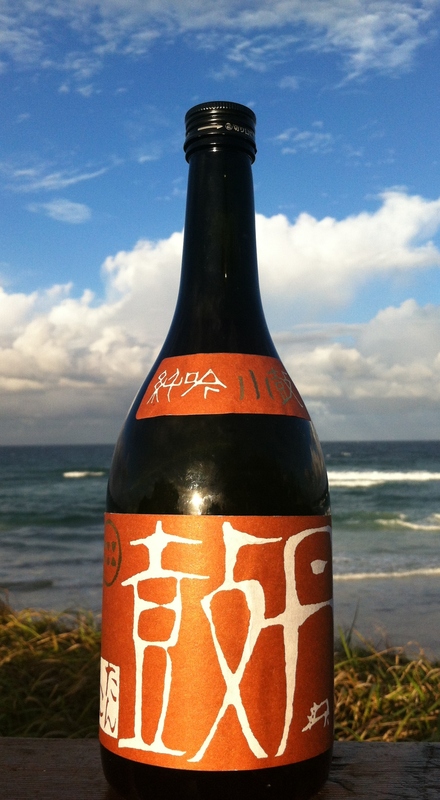 But imagine my surprise when it was casually mentioned that some of the Kotsuzumi portfolio was available in Australia! What?? Since when? How did something like this get by a know-it-all like me? Nonetheless it is true that the Kotsuzumi Tokebetsu Junmai and the Kotsuzumi Junmai Ginjo Hanafubuki are in fact available through Sake Online. Grab some! Slightly earthy aromas, blended with white chocolate, white flowers and hints of poached pear. Plush and full on the palate with a dollop of umami and a slightly spicy, grippy finish. Also recommended slightly warmed or room temperature. If you find yourself in Japan with the chance to try the Tanko I highly recommend it as one of my all time favourite sake. Their Daiginjo are also nothing short of outstanding and interestingly keep to the brewery policy of not milling rice any lower than 45%. In this day and age of seeing who can go lowest with 35% becoming the norm for competition sake, I find that a breath of fresh air. Arguably, to go much lower than 45 or 40% the sake loses its umami and the whole exercise becomes more about bragging rights than sake quality. As I’ve said all along, one of the main things required to bring sake to a wider audience is education. So many people don’t know what sake is or have skewed or misinformed views of sake that prevent them from trying it (or in some cases trying it again). And who is to provide the education? It’s worth noting that being born Japanese does in no way credit one with an instinctive knowledge of sake so forget listening to the Japanese person who says “of course I know about sake, I’m Japanese”. Nor does years of training as a wine sommelier instantly make one an expert on all alcoholic beverages so be wary of the one who “knows wine, therefore knows sake”. So who to listen to? 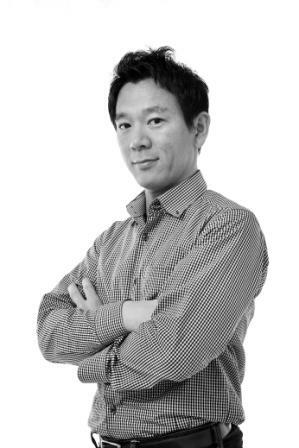 Well, someone who has been out in the trenches for longer than most waving the sake flag loud and proud is Toshi Maeda. After arriving in Melbourne in the mid-nineties from Kobe Japan, Toshi enjoyed a fling playing drums on the pub-music circuit before settling into hospitality. Like many young Japanese he wasn’t too enamoured with sake in his younger years, preferring beer and wine with the occasional glass of sake here and there. However, working evenings at a Japanese restaurant Toshi found himself constantly asked by Australian customers for recommendations from their vast sake menu. In an effort to better help his customers Toshi valiantly began tasting as much sake as he could and like many others headed down the sake rabbit hole never to return. Fast forward a few years to 2007 and Toshi eventually opened his own izakaya (casual, shared dining restaurant) in Richmond, Melbourne naming it appropriately enough Maedaya. With the idea of making sake the star, Toshi took a big chance by having no wine on the menu and no BYO. A brave and admirable move! Despite meeting with a little apprehension from some when first opening, customers opened their minds and gave sake a chance finding something on the menu of 115 different sake that they liked. At a recent sake tasting at Wagamama Restaurant in Brisbane I caught up with Toshi for a bit of a chat about all things sake. When I asked how the “wineless” drinks menu was being received these days Toshi explained that with reputation firmly in place most customers know what they’re in for and among the regular customers there are those that have their favourite sake and just stick to those every time they come and those that want to try something different each time. I have to admit when I visited Maedaya last year I was so enthralled with the range of sake available I didn’t even notice the lack of wine. With that much sake, who needs it? However Toshi also notes that there are still many that come to the restaurant with the image of sake as being a high alcohol spirit to be drunk piping hot as a shot at the end of the meal. This is one of the misconceptions he is keen to erase. “I want people to actually try sake and enjoy it and want to drink it again,” he says. A very important point. Having people try sake once and walk away from it as a one-off experience will do nothing for the industry moving forward. It’s about liking it enough to come back again and again. When I asked Toshi how he convinces customers to go for sake over beer or wine he explains, “I tend to treat sake as wine. You have wine with food and sake should be drunk with food too. Whether it’s a meal or just some simple salty snacks or edamame. And sake goes with so many types of food. Especially with fresh seafood. If you drink wine or beer with some seafood it can leave a strange aftertaste. But with sake the flavours work together without clashing.” However, Toshi also acknowledges the future of sake in Australia lies in experimenting sake with different styles of cuisine besides Japanese. “Sake can be matched with French or Italian dishes very well. Also cheese works well with some ginjo or junmai sake. I wish more restaurants would have at least one or two sake on their list so customers can experience sake with other cuisine,” he says. On the upside sales are strong through his online retail service sakejapan.com.au showing more Australians are in fact drinking sake at home instead of just saving it for when they are at a Japanese restaurant. After watching Toshi in action on Wednesday night it was clear he is passionate about helping people enjoy sake. Canapés were matched with warm sake (Kizakura Yamahai), a Yuzu infused premix, the fantastic Rihaku Blue Purity Junmai, the sweet and sour Kizakura Nigori and ume-shu (plum wine). And sure enough with a range that wide everyone seemed to find something to their taste. Indeed not all sake is for everyone but there is at least one sake for everyone. If you’re in Melbourne by all means pop in to Maedaya and have a chat with Toshi and see if he can’t find a sake to put a smile on your face and if Melbourne is a little far sakejapan.com.au is only a click away and you can get all your sake goodness delivered to your front door. As sake’s audience grows it’s good to know there are generous, knowledgeable and approachable people like Toshi Maeda out there on the front lines busting the myths and showing people how good sake can be. Respect. So after the barrage of linguistic lunacy in my last post I figured we may as well continue on and look at some other common words and characters often found in the names on sake labels. Most of these are quite high in usage so you’re bound to come across them at some point. *Not so much a word as a particle to indicate possession or ownership is NO 乃. To be honest I feel like this one is in higher usage than some of the other ones already looked at but there you go. NO will always be in the middle of a name as it means to belong to something. Names such as Koshi no Kanbai (the winter plum of Niigata), the previously mentioned Sawanotsuru (the crane of the swamp) and the sake from a couple of posts ago Yoshinogawa (the river of joy). Incidentally, this character for NO is an older way of writing. These days just about anywhere besides sake labels the character would be written as の. This character can is used in conversation to signify possession and is seen all over the place in Japanese life. *白 HAKU or SHIRO, known to us as “white”, is positively everywhere! Again a bit of a universal meaning of purity. Due to the fact that it features in the name of several of the larger breweries you tend to see it about quite a bit. Hakutsuru (white crane), Hakushika (white deer), Shirayuki (white snow) all from Hyogo. Another, Rihaku from Shimane appears to translate to white prune but is actually the name of Chinese poet Li Bai (Li Bai is the chinese reading for the same characters that spell Rihaku) and is often seen with the English name “Wandering Poet” written on the label. *The Japanese love of hot springs (onsen) is no secret so it’s hardly surprising that the kanji for “spring” 泉 IZUMI or SEN and it’s rejuvenating undertones features on many sake labels. Kameizumi (turtle spring? )from Kochi, Gunmaizumi (Gunma’s spring), Kinsen (golden spring) from Hiroshima. *It is also quite common for breweries to use the old name of their region in the brands. Probably the most common is Niigata. The old name for Niigata was 越後 Echigo but the first half of this character also reads as 越 KOSHI. You’ll notice many Niigata sake bearing the name KOSHI followed by the previously mentioned NO to indicate being from Niigata. Obvious examples are Koshi No Kanbai, Koshi No Hatsu Ume (Niigata’s first plum), Koshi No Tsuru (Crane of Niigata). Other regions also use either their old name or the name of the regional brewers’ guild (Toji Ryuha) such as sake from Kochi bearing the name 土佐Tosa or sake from Iwate with the name 南部Nanbu. *鹿SHIKA-deer. Fairly common in Kansai sake. There really are tons of others but I think these ones will pop up often enough to keep you interested. Knowing what the name of your favourite sake means can add to the depth of enjoyment so as I said before, don’t be put off by not understanding the names you might find they’re not quite as hard as you think. Probably the biggest obstacle for people trying to get into sake is the language barrier. Depending on how far you wish to delve into the sake world it can feel as though you are learning a whole new language. And I guess in essence you are. So much of the shop-talk doesn’t translate well into English leaving folks to try and decipher the Romanized text of sake labels and menus resulting in plenty of confusion. On top of that it is the names of the brands/breweries. You’d almost be forgiven for giving up and sticking with beer. Almost. Interestingly though, many of the characters (kanji) that make up the names of the sake brands are widely used every day words. When talking about all things Japanese you may notice some of these words crop up quite a bit, not only as names of sake but also places and surnames. If you can get a grasp on some of these regular occurring words it may make it easier to remember the names of your favourite sake (and people and places for that matter). Here are five of the more common ones and the reasons behind their use. 1. The most widely used kanji among sake names is 山 YAMA. Meaning “mountain”, yama signifies strength, majesty and longevity (a recurring them you’ll find with sake names). 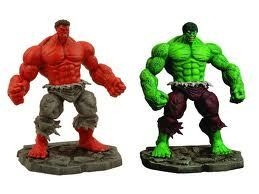 Popular examples include: Otokoyama (man-mountain), Ooyama (big mountain), Tateyama (from Toyama, two Yamas for the price of one!). 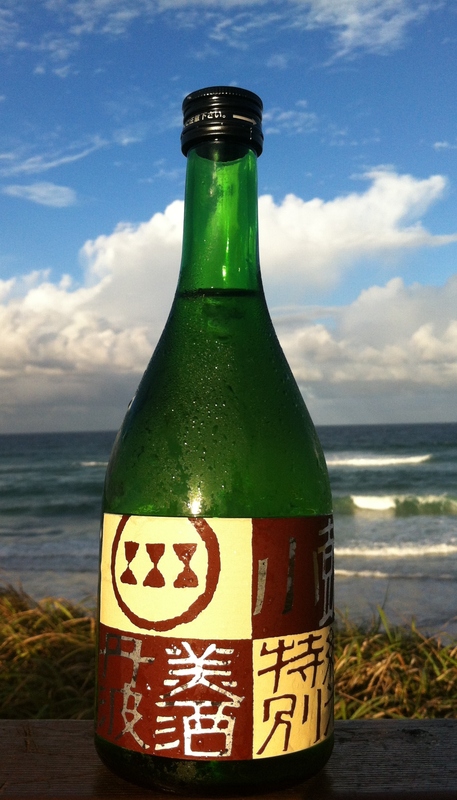 You may also spot this kanji on a bottle of Yamahai 山廃 style sake. Yep, same YAMA. 2. Next most popular kanji is 鶴 TSURU, crane (as in the bird of course not the crane for building construction!). In Japan the crane is a symbol of good fortune. It doesn’t take more than a glance into Japanese art and mythology to see the importance of cranes to Japanese culture. Also, in Japanese mythology cranes are said to live up to 1000 years which again appeals to the symbology for breweries with long history hoping to be around for many more years to come. Japan’s largest sake brewery, Hakutsuru (white crane) and Sawanotsuru (crane of the swamp) from Hyogo are two of the better known examples also Taketsuru (bamboo crane) from Hiroshima among many others. 3. The next most popular kanji is actually two kanji put together to make 正宗 MASAMUNE. The interesting history (legend) behind this one actually goes back to a specific brewery in Hyogo. 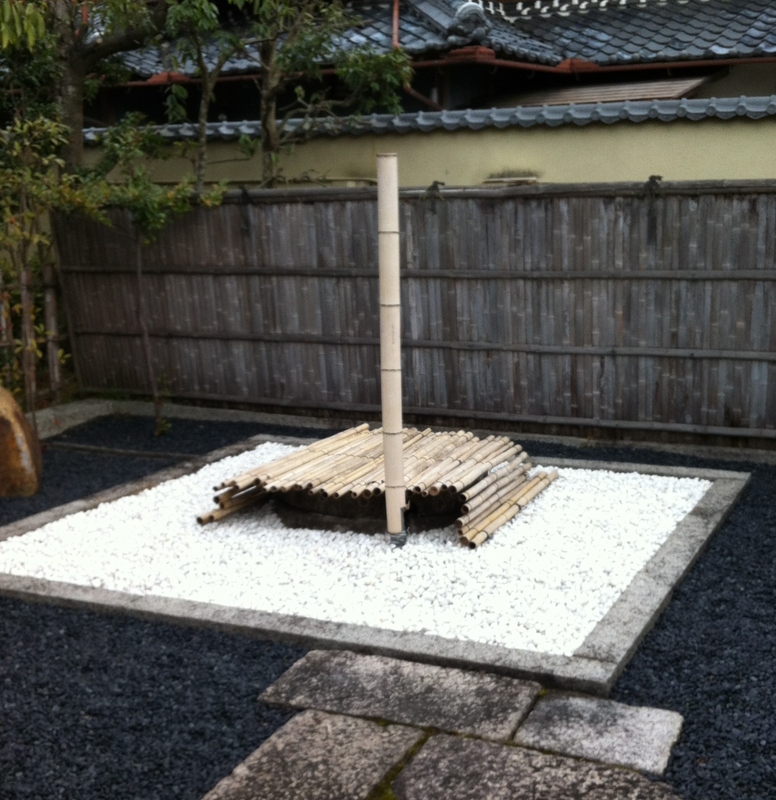 Up until around the 3rd Century all sake was cloudy and unfiltered. It was around this time that the first processes towards making clear sake through filtering and pressing were discovered. 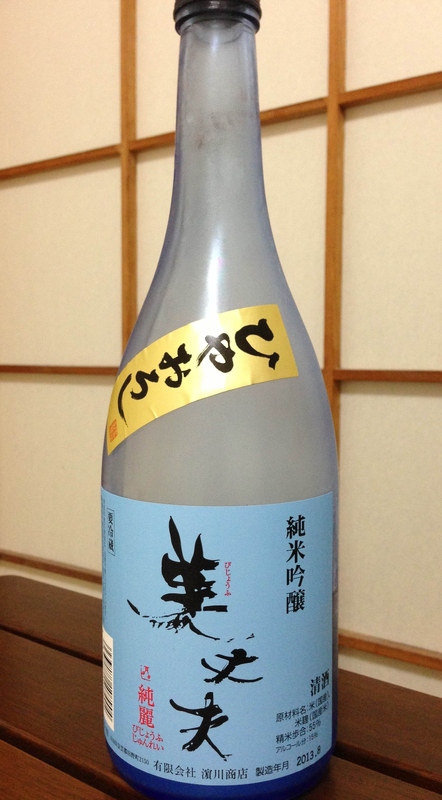 This new type of “clear sake” was called SEISHU 清酒 which is a literal translation. Many years later this term was picked up by the government to define sake for tax purposes (if you look on any sake bottle you’ll find this kanji somewhere). Fast forward to 1840 and the then President Tazaemon of the Yamamura family’s brewery was looking to come up with a new catchy name for their sake to break away from the popular theme of naming after Kabuki theatre characters. On a visit to an acquaintance at a temple in Kyoto he happened to notice a book lying around with the name Masamune in the title. Now for a bit of a Japanese lesson; most kanji characters actually have two or more ways of reading depending on context and which other kanji they are combined with. This is probably the biggest headache for anyone wanting to learn to read and write Japanese. In the case of MASAMUNE, the first kanji 正 means “righteous, justice, correct”. There are actually four ways to read this kanji but SEI and MASA are all we need to know for now. The second kanji MUNE 宗 can mean “a religious sect, essence, main point” and has three readings but again we’ll stick with just MUNE and SHU. So upon seeing the name MASAMUNE Mr Tazaemon realised that with a bit of wordplay 正宗 MASAMUNE could be read as 清酒 SEISHU thus coming up with a cool new label. The Japanese love a bit of wordplay so it didn’t take long before word got around and other breweries started using MASAMUNE on their labels too. However by 1884 when the brewery went to the government to trademark the name MASAMUNE they found they couldn’t due to the perception of MASAMUNE as having become generic. So they plonked SAKURA (cherry blossom) in front of it and gave us Sakura-Masamune. The part two to the MASAMUNE story is the reputation of the legendary Goro Masamune, swordsmith from the 1200s. Some breweries go for the metaphor that their sake has a crisp, clean, “kire” cut or more accurately, “finish” to it just like a perfect sword from Goro Masamune. These days there are still plenty of breweries bearing the MASAMUNE moniker; Yamagata Masamune, Kiku Masamune and Hakuin Masamune to name a few. 5. Rounding out the top five is 大 DAI, TAI or OO. Basically meaning big or great, you’ll see this kanji everywhere from sake labels Daishichi, Taiheizan, Daiginjo (great ginjo!) to place names (Osaka 大阪) and even on menus in restaurants to signify a larger serving of a dish where available. This is merely scratching the surface of the topic of kanji use in sake labelling but I believe just a little bit can go a long way towards understanding the complexity of labelling and the Japanese language for that matter. Don’t let a little thing like “linguistics” put you off trying something off the sake menu! Yet again I’ve fallen to the trap of getting bogged down with other things and have unfortunately neglected my Sake Australia duties. The good news is I’ve been busy with things sake related. More on those another time. I’ve just returned from another stint in Japan where I drank plenty of amazing sake, ate lots of great food, met lots of interesting people and learned tons of new things. Always an adventure. However I thought I’d come back with something a little local(ish) as in something related to sake available in Australia. As I’ve mentioned before, Niigata is an amazing region for sake. A suitable climate, rich traditions and the highest sake consumption of anywhere in Japan has helped establish the region as probably the premiere sake destination. Similar to wine regions, Niigata is made up of a good cross-section of impossibly tiny producers whose product is virtually unseen except around the local vicinity and larger producers shipping sake all over Japan and even as far flung as humble old Australia. Yoshinogawa fits in the latter. Again similar to wine and beer producers, the common perception is that the bigger the producer the blander or more “commercial” the product. While in some cases that may be true, for the sake industry it definitely isn’t the rule. Many of the larger producers make great sake, it’s just that they augment their sales with production of cheaper lesser products which can become the thing they are better known for. Now all this is a bit off course because Yoshinogawa is not that big. Just relatively for Niigata breweries. Also as the oldest brewery in Niigata (est. 1548) they are one of the “faces” of Niigata sake. So lets start at the top. I know I’ve tended to stay away from the dizzying heights of Daiginjo in favour of more approachable styles, but in this case I’ll cut to the chase. While I would never dare to be so blasé about Yoshinogawa as to describe their Daiginjo as “typical”, I will say if you like Daiginjo, you’re gonna love this. Matured for three years at minus 5 degrees celcius (the low temperature results in a slow maturation), plenty of complex floral aromas and tight pine and stone-fruits on the palate with plenty of plush fullness without being overbearing. A dry, clean, light, fleeting finish gives a settled and regal sake. Very cool and easy to like. Yoshinogawa is available through several restaurants across Australia. Being a local to Queensland I can only vouch for sure of it’s availability at Ferry Rd Beer and Wine in Southport and Cru Bar Cellars in Brisbane. If you spot it, don’t be shy of giving it a try, Yoshinogawa is unlikely to disappoint even the most hesitant of new sake drinkers.